Some big names will take the stage at the 2017 CMT Music Awards, but many aren’t performers. That 70s Show star Ashton Kutcher will make his second appearance on a country music awards stage, presenting alongside his The Ranch and 70s co-star Danny Masterson. Other Hollywood stars presenting at the awards show include Katherine Heigl, Johnny Galecki of The Big Bang Theory, Jada Pinkett Smith, Josh Henderson and Kathie Lee Gifford and Hoda Kotb of the Today show. The country music community will also be well represented, with Nashville‘s Clare Bowen and new cast member Rachel Bilson set to present, along with Dustin Lynch, RaeLynn, legend Reba McEntire, CMT’s Cody Alan and Katie Cook. 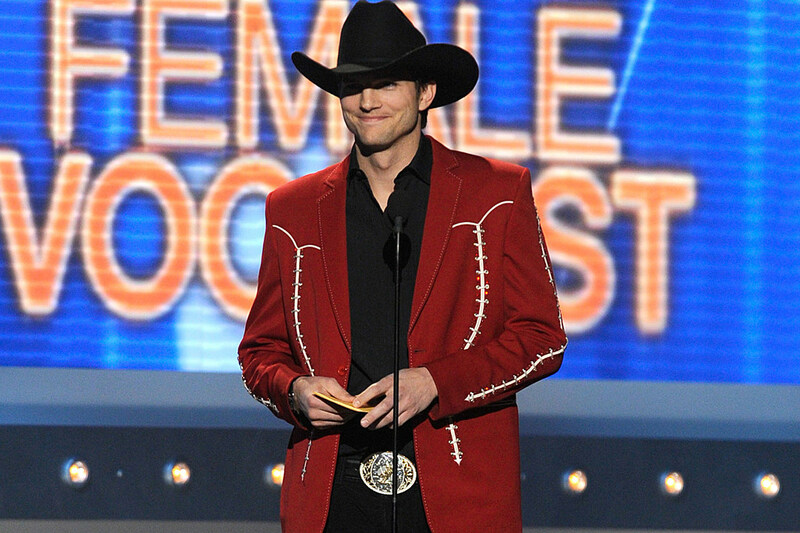 This isn’t Kutcher’s first rodeo at a country music awards show. He received flack from some country stars after his appearance at the 2012 ACM Awards, when he came out to present Female Vocalist of the Year in a full cowboy outfit and sang a few lines of George Strait‘s “I Cross My Heart,” causing the likes of Miranda Lambert and Justin Moore to question whether or not he was making fun of the genre. Kutcher defended the stint, saying he wasn’t intending to mock anyone, and dubbed himself one of country music’s biggest fans. Along with the superstar presenters, the 2017 CMT Music Awards will feature a variety of collaborations — Luke Bryan will pair with Jason Derulo, Florida Georgia Line with the Chainsmokers and Keith Urban and Carrie Underwood. Nashville’s Charles Esten will host the annual award show when it airs live from the Music City Center in downtown Nashville on Wednesday (June 7) at 8PM ET. It appears that you already have an account on this site associated with . To connect your existing account just click on the account activation button below. You will maintain your existing VIP profile. After you do this, you will be able to always log in to http://kekbfm.com using your original account information. Sign up to have exclusive KEKB Country Club contests, events, coupons, presales, and much more delivered to you for FREE.